Fox Kids & Baby Lookbook : Hot Stuff! Hands up all parents who loves to shop for clothes ... For their children! When it comes to affordable AND fashionable clothes for kids, FOX Kids and Baby has always been on our radar. Throughout the years the brand has been one of our 'to go place' if we are looking for casual chic fashion for the boys. Given how children tend to outgrow their clothes in double quick time, clothes that make economic sense and looking good at the same time are always a plus in our books. FOX kids and Baby holds a whole range of clothes for those from age 0-12 . The brand is well known for their mix of causal clothes, ranging from singlets , printed tees, shirts, jeans and shorts for both sexes. In addition to their own designs, they have cartoon characters prints such as Smurfs , Snoopy, Hello Kitty, Mickey Mouse , Mr Men and more. Their clothes are reasonably price with some as low as $9.90. We were in awe as soon as we step in the shop at Parkway to choose our outfits. Colours were splash in all directions so much so it became a dizzily choice to pick the outfits for the boys. In the end, the boys decided to go for 2 different selections wih their budget. We present 2 great looks from the current collection. The outfits range from $16.90 per piece. However there is a promotion now for a set of 4 at $50 or a set of 2 at $30. The next look will be from what we term as the 'cruise' collection. These outfits would put the boys right up there on any sailing trip or causal chic events. In addition to the styles above, you can opt to go basic wih tees and knit bottoms at $9.90 each. Equally stylish and wallet friendly in our books. You could also pick up a swimwear or even a pair of stylo mylo 'shoes' flip flops. Sleepwears and accessories such as sunglasses are also available in store. 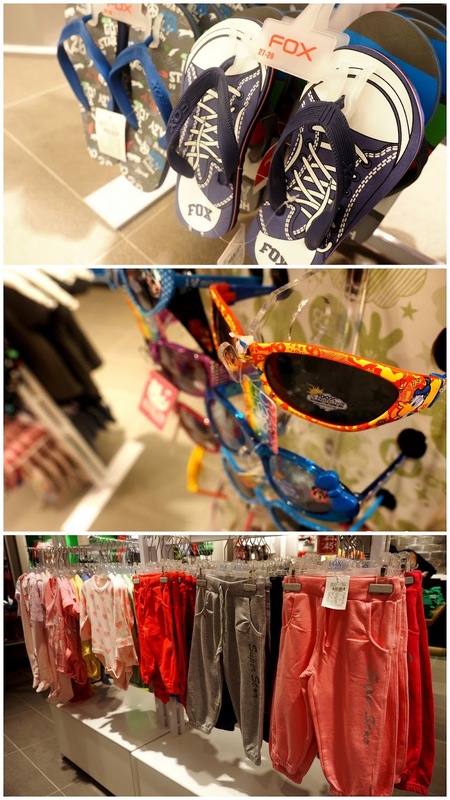 Speaking of which, the spacious and tidy Fox store at Parkway Parade set up made shopping a breeze at FOX. We highly recommended to pick up one of these funky and affordable shades from $13.90 onwards. It will surely spice up any outfit you pick. There is an exclusive lifetime membership free if you spend $80 nett on a single receipt. You will get to enjoy perks such as FOX points to redeem vouchers , 25% discount on birthday month , invitations to FOX events and more. For terms and conditions , do refer to FOX website. There are simply too many styles you can have with FOX clothes, so much so, it will be impossible to showcase all in this post. We recommend a trip down to FOX Kids & Baby stores for a peek. They can be found in major shopping malls throughout the island. We enjoyed the shopping spree so much that we are delighted to announce that FOX will be our official clothing wear for the next few months. Do stay tune here as we bring you the latest FOX related news and events !